This set of photos was taken over a week long period starting on November 21, 2014. The "Take It!" has been a very long time in the coming. 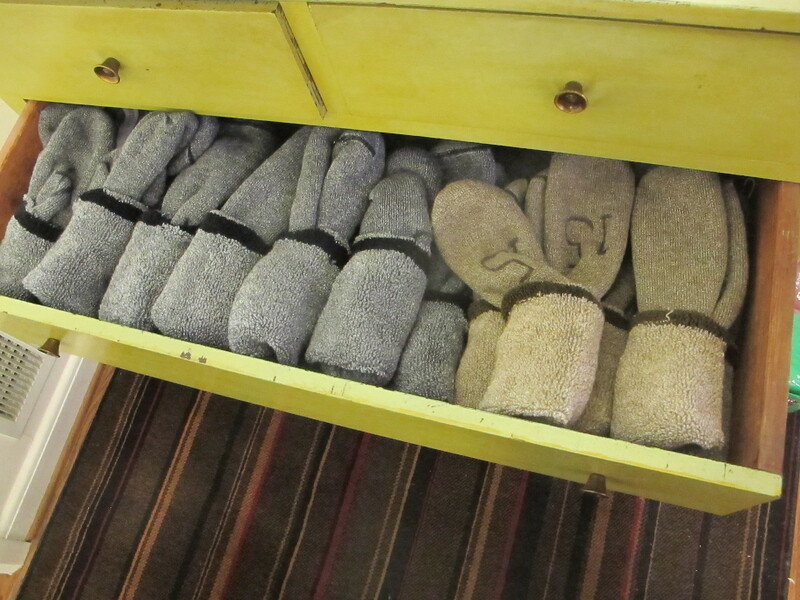 This year I urged myself to share my story on how I handle the business of providing myself socks. Each year in the fall, I buy a bunch of three pack socks that are a seasonal offering at Costco. I proceed to take them home and using a sharpie - number the socks as they are paired up in the package. The ink is then allowed to dry for about a week. The next step is to cut off the elastic at the very top of the sock, leaving some less tightly woven elastic still as the top of the sock. This trimming off of the tightest of the woven elastic allows me to wear the socks all day without getting at the end of the day - that look when I take off my socks - that is almost a notch on my skin. Without this trimming - my leg looks like it is still being squeezed by some invisible force. It plain old looks odd. 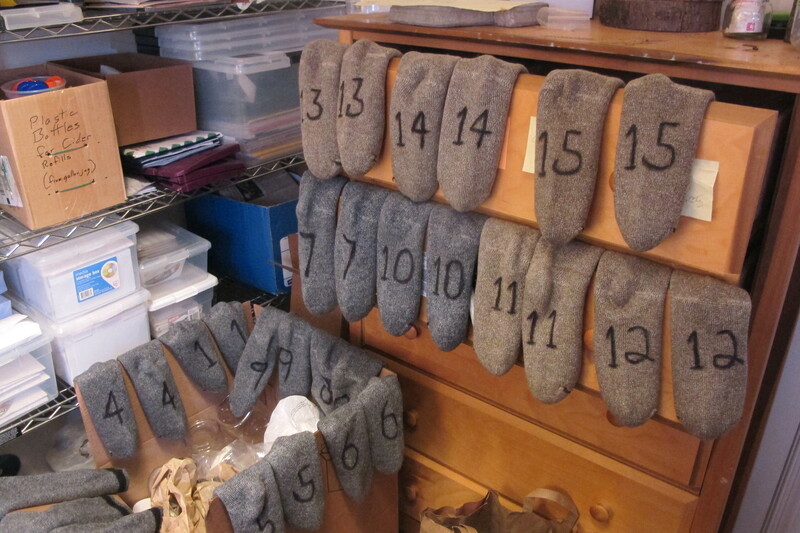 The now ink dried socks are then taken and washed all together in really strong detergent and placed upon hangers that have big paper rolls on the bottom of them which allows for quicker more efficient drying. This also helps them keep their shape and not shrink as they do when placed in a dryer. As you can see - the game of " Match the Socks " has been greatly simplified, saving me lots of time, and frustration as I am slightly color blind. This year I splurged and bought 15 pairs of heavy duty socks ( I wear these socks all year long as they are thick and provide cushion for my feet ). 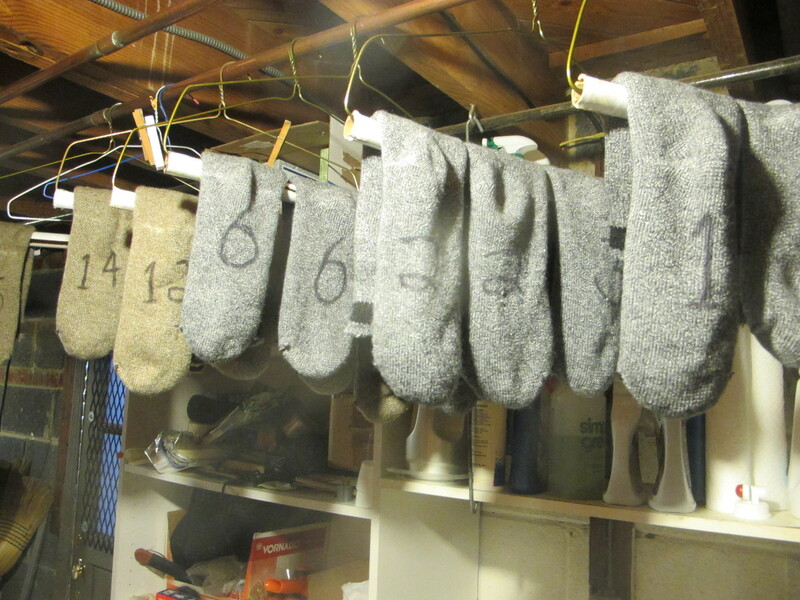 I got an early start on using the Class of 2015, and in so doing will take the class of 2014 socks that are all washed, and in very good repair to a homeless shelter where hopefully they will help keep someone's feet warm and dry. The trip to the Shelter will be another story. I have done this before and it is always an experience. Here is hoping my little story has brought you a laugh. PS: The best of this is when at that rare visit to a Doctor and I take off my shoes for whatever and the bottom of my stock covered feet come into view - it is always a short story filled with laughter. This is much more efficient than how I handle my socks. I should do this for Jim. He can't seem to keep a pair of socks more than a month. I too have a sock strategy to help keep me from losing them. Ha!! Thats pretty funny. Man I could never cut the elastic off though. I really like the grip socks take. I buy like a 5 pack of socks every 2-3 months. Thats my strategy haha. What a clever tactic. I don't think I would cut the socks but I could definitely take up the marker technique.